This alleged mass-killing occurred on December 11, 2012 in Aqrab, Hama province, Syria - about two miles north of Al-Houla, site of the Houla massacre. In the first anti-government activist reports, 125-150 civilians - men women and children, primarily or totally of the Alawite religious minority shared by President Assad - had been blown up. It was done by government forces and "Shabiha" (Alawite militia), who had been holding some 200+ Aqrab Alawites captive. That initial story has been seriously challenged and appears completely untrue, and the puzzle of what then did happened has been left unsolved. As many as 233 "enemies of God" (as rebels often call Alawites) seemingly disappeared, and the only people who really know what happened to them are the ones telling false stories about it. Note: The following page is a bit too dense with info, and it doesn't even have all our findings worked in yet. Over time, it will be expanded somewhat as well as streamlined for readability. Those hungry for more information yet can see the discussion page, those hungry for less can just skim the page below. Also there is a decent summary of the case, Channel 4's important video dispatch, and a record of agitation to increase its profile, publicized at the Citizen's Investigation into War Crimes in Libya (and Syria) website. Aqrab, Google-translating either "Scorpion" or "Sundial," is/was a mixed Sunni and Alawite city of about 11,000 inhabitants. 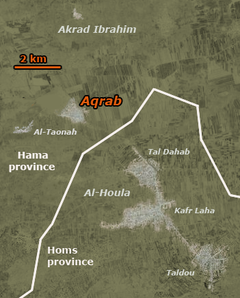 It is located (here on Google Maps) in Hama province, even though rebel-controlled Al-Houla, only two miles to the south, is in Homs province. As shown on the map here, the line between provinces seems to run just north of the three towns of Houla (with the massacre there happening in the southernmost Taldou). The incident is said to have occurred in Aqrab, an Alawite village. But it's more a mid-sized town, with some reports giving it a majority Sunni population. For example, after Channel 4's Alex Thomson traveled to the town (as he earlier traveled to Taldou), he described "a low-rise, densely packed town of 9,000 Sunni and 2,000 Alawites," with the report specifying the stricken Alawite district was in the west of town. 11,000 seems reasonable population for a city that size on the map (Taldou's population was once similar). However, some sources suggest the events, in whole or in part, may have transpired in a smaller, presumably Alawite village a few kilometers north. One way or another, it's worth placing on the map above. Cuban news agency Prensa Latina, for example, reported that the events occurred "near the Syrian town of Akrab," in a place called Akrab Ibrahim. Akrad Ibrahim (أكراد ابراهي) is a small village around five kilometers north of Aqrab up the mountains (location on wikimapia). It has one dominant building which looks very much like the typical schools every village in the region has. "Akrad" means "Kurdish" when auto-translated into English. There are some other clues and related developments and rumors, a Kurdish link, and a dead sheikh, that tie this village into events in other ways that are discussed below. Based on eyewitness testimonies, Presna Latina reported "there are also 19 Sunni Kurdish civilians among the victims." 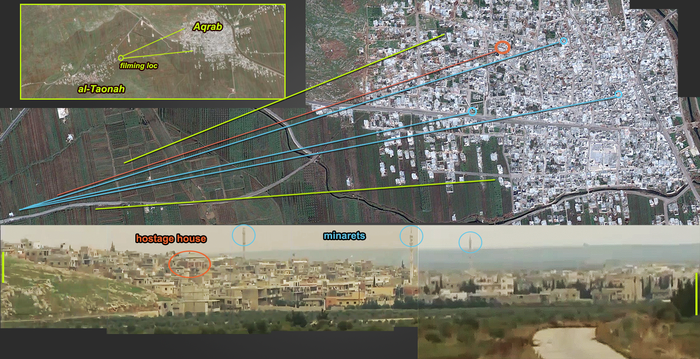 This place is mentioned in some other reports but mostly described as neighborhood in Aqrab, not as a separate village. Searching for the Arabic name led to announcements on facebook (Dec 9) and a Qatari forum (Dec 10) talking about gangs looting and abducting people in this village which is described as majority Sunni with a Kurdish minority (hence the name), while the villages further up the mountains are described as Alawite. Given the many possible narratives and the problematic auto-translation from Arabic, it is hard to make sense of the events they describe, but both talk about a large family named Najjar who either was abducted or did the abducting, either by Alawites or are Alawites themselves. The announcements call on the readers to inform news media and come to help to prevent a massacre that is somehow expected. A Sheikh Ali in Aqrab is said to be able to confirm events. (As we'll see below, Sheikh Ali is dead). Regardless of the details described here, there was definitely something building up in this village and it seems like the confusion about this topic stems from the fact that two events are merged into one - possible fighting and shelling and hostage negotiations in Aqrab down in the valley and a massacre or tragic event of sorts happening in the school building in Akrad Ibrahim a couple of kilometers away and up the hills. The first narrative claims that there were 10 pro-regime gunmen who were barricaded in residential buildings with 150 civilians (Alawites also). A delegation was sent to the buildings, made up of 2 Sheikhs and 1 retired officer from the town, in order to negotiate the moving of Alawite civilians out of the building. the delegation was not allowed to leave. Clashes then took place between the pro-regime gunmen and rebel fighters from the neighbouring Houla town, explosions then took place which led to the civilian casualties. 2 rebels were also reported to have killed, also reports that the 3 person delegation was killed, and the head of the pro-regime militia. The second narrative is that a series of explosions went off by the buildings inhabited by Syrian Alawites civilians in the town. The third narrative is that pro-regime militiamen held Alawite civilians captive in the buildings, and that the rebels attempted to free the civilians, causing several explosions which led to the death of the 125-150 civilians. This assemblage is strange, confusing and not entirely flattering to the rebel side. It was, however, widely cited in subsequent media reports, and frequently taken as reason to wonder a bit more than usual just what happened. A rebel who spoke to Reuters by telephone said fighters had clashed with the army in Aqrab for four days. Rebels had surrounded one building and accused the Shabbiha of using residents hiding there as human shields. “There were 200 people inside and we called on the residents to leave, but the Shabbiha held some women and children by gunpoint. Eventually talks fell apart and the government shelled the building,” said the rebel, who called himself Maysar. The BBC and most others would go with what the survivors said on rebel videos. The BBC's first report mentioned the confused SOHR versions, but also cited the same Alawite boy and rebel fighters, and gave a range of death tolls topping out at "as many as 300." This report is covered in more detail below. The majority of journalists covering this - and other Syrian incidents - claim that activist reports cannot be confirmed or denied by on-site investigation. For example, consider the BBC's first and fairly detailed report of December 12. It said "it is impossible to verify this complex narrative," and noted "there has been no word at all so far from the government, which is accused of killing its own supporters in order to blame the rebels." The "complex narrative" the report passed on, from rebel and activist sources, seems patched together and rather confusing. Activists said the [Shabiha] militia-controlled building was being besieged by the rebel Free Syrian Army (FSA). The Shabiha, who are almost entirely Alawite, were using the civilians as human shields, according to the activists. They said village elders were sent to negotiate a release of the hostages and surrender of the militiamen. But the elders were seized and killed, the militia threw grenades at hostages who were trying to run away, and then blew the building up as they themselves escaped, the activists claimed. The activists' account even said that government forces later fired rockets at and bombed the building with aircraft, killing more than 200 women and children trapped there, our correspondent adds. So the rebels besieged and surrounded the building, until they learned of a huge number of human shields held there. Negotiators, with unstated terms, were killed by the Shabiha, who then killed their captives with grenades and/or blew up the building somehow, trapping nearly everyone inside/beneath rubble, and then slipped away through the rebel cordon never to be seen again. The building explosion wasn't enough to kill their now-unneeded human shields, so the government itself finished the job with both artillery and air strikes. They did this to frame the rebels, who were there the whole time but apparently never fired a shot and remained stunned on the sidelines as these events cascaded around them. As far as we know, no one on the opposition side managed to video-record a single one of these events. The Aqrabi villagers say they mounted a counter-attack to try and free the hostage. There were armed clashes and injuries. As widely noted, there have been no videos posted of 125-150 massacre victims - or any number - to confirm the stories. That in itself would make the case highly unusual for a Syrian massacre, but then this was already an unusual case. There are no previous alleged massacres of so many Alawites in one place surrounded by rebel fighters to compare this to. No bodies to show is the most straightforward - but not only - reason no bodies would be shown. Fear that the propaganda coupof more dead baby images would backfire against the opposition this time is another possible reason. The lack of video and official denial were cited by the analysts at Enduring America, along with "notable omissions" like how the Local Coordination Committees "never reported a mass killing from Aqrab." (at least not officially - someone from the LCC reportedly did partially confirm it, as EA noted here) Between the three, the collective doubt led to a possibility worth "pursuing" in which "the town was bombed, and the largely-Alawite population has split into pro- and anti-regime groups. There has been fighting. Perhaps 6 to 10 people were killed by the shelling. There are further concerns that other residents, held hostage or cut off from escape, were slain." That's doesn't cover everything even if stretched taut. But it's an admirable effort, considering the vast gulf between the two (main) narratives and the unknown number of unknowns between them. That was acknowledged with a later post after learning of Channel 4's version (see immediately below). As of now, it's not possible to reconcile the two narratives. Both rely on eyewitness testimony. Nobody, it seems, has actually witnessed a "massacre," however, and there is no video of the bodies uploaded by either side. The reality is that all we know for sure is that there are two conflicting and unsubstantiated claims. We also know that there has been intense bombing of the village, at least since the FSA moved into the village on December 2-3rd. The first major and strongest case by far for a fabricated event came from Alex Thomson’s second dispatch, with a video report for Channel 4 News. On Wednesday Thomson himself and his team travelled from Hama to Aqrab where they interviewed a number of witnesses. This was "the first independently observed story of Aqrab from the first outside journalist to reach this area," with the three witnesses interviewed independently, and confirming each other on all the major details of what happened. He says they were supported as well by "dozens" of others he spoke to taking refuge in Al-Taonah, and who wanted to stay off-camera. According to the displaced persons, on Dec 2 around five cars full of bearded men with non-local accents came from the direction of Al-Houla. They all insist, as did everybody else we met, that the rebels from the Free Syrian Army (FSA) corralled around 500 Alawite civilians in a large red-coloured two-storey house belonging to a prominent businessman called Abu Ismail. They then say they were held – around 500 men, women and children – in this building until the early hours of Tuesday 11 December. Nine days. They all agree matters came to a head when a delegation of villagers was sent on Monday at 4pm to break the deadlock. [...] It appears negotiations ran between these elders and the rebels for around four hours, ending in deadlock at around eight o’clock on Monday night. At that point, shooting broke out, the rebels firing through the windows and shouting that they had booby-trapped the building. The eye-witnesses say that the shooting died down at about midnight, after which a deal was done. In screaming night-time chaos and intermittent shooting, three vehicles took around 70 of the prisoners to safety in the nearest village [Al-Taonah] a mile away. However, it seems a fourth vehicle took a number of prisoners to al-Houla, where two – an unidentified woman and a boy – were treated for injuries in a rebel field hospital. The woman and boy blamed pro-government militia for taking the prisoners, according to rebel websites, and that is the version of events which has gone around the world. Until now. The thrice-bombed house, as filmed on the 13th, is shown and discussed below. Evidence of hundreds of dead was not found. Like others, Thomson pointed to the lack of video evidence on Youtube, which made little sense given the rebel narrative of a massive government crime that occurred, after all, in an area they controlled and could film at leisure. And further, he points out how the rebels never mentioned these hundreds of prisoners held by Shabiha during the nine-day standoff, even as they released videos and dispatches about their conquest and patrolling of the town, ignoring a "propaganda coup" for over a week until after its alleged culmination. 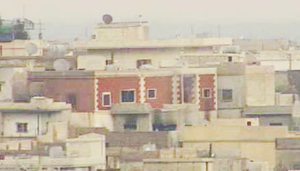 The house Thomson had pointed out as the site of the Alawites' imprisonment, inset at right, is not hard to spot. It's large and red, at least on the visible upper floor. By lining up the hill side of town and all three minarets, it seems the crew filmed from southwest of town, near this building on the outskirts of Altaonh. The house in question is likely the one dead-centered here on Google maps. (see below for visual explanation.) This is in northwest center of town, possibly in the western, Alawite district or in the Sunni area but near the "front line" (we don't know where the line was). Teenage boy survivor, badly smoke-stained hands, possibly burned as well. 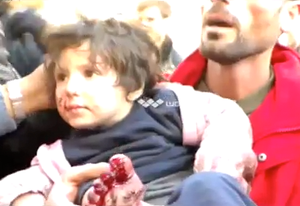 Possibly related: dead 6-year-old girl in Houla - soot-stained face, head sliced open (see here). More accurately, this section is for those who escaped their captivity and can speak about it. The alleged Alawite prisoners are still most famously seen as the Shabiha-blaming rebel-story-supporters in rebel-held Al-Houla. These few will be studied here in more detail in time. But besides those few, controlled glimpses, is a broader body of people supporting the opposite narrative. And then there are those, however many, who've been killed, and the rest, however many, that remain alive in captivity and great danger. The best information comes from the large number who made it out and can talk away from the rebels. A report from Lebanese Al-Mayadeen TV is of great interest here. It can be seen in the second part of this video, starting at 6:30. The English subtitles tell us Al-Mayadeen’s crew couldn’t enter the town itself due to the fighting, but visited neighboring villages where refugees reside. In a large building, they film at least three dozen people of all ages, getting along as they can. “Most of them fled Aqrab after the town’s siege.”  These seem to be primarily those who Thomson’s first witness said ran away before the captive-taking, although some seem to have been held in the prison. An old man told Al-Mayadeen “the armed gangs attacked them, from Al-Houla and Aqrab. … They stole the peoples’ homes then torched them. … some of them left. As for the other ones, where they took them, we don’t know. … this is our problem. They have ALL sorts of weapons.”  Elderly woman Hayat Youseh recalled for Channel 4 "they wore black ski masks. They took our phones and keys. They forced us out of our homes and set fire to them. I hope God burns them like they burned our homes." Interestingly, this is almost an exact quote from a different, younger woman displaced during the nearby Houla Massacre (see video here, 6 :14). Both Channel 4 and Al-Mayadeen heard that those who didn’t escape Aqrab in time numbered around 500 Alawites, who were all taken hostage. The rebel captors entered negotiations with the authorities to exchange four of their arrested leaders for the civilians, on generous terms. "There was an agreement to release civilians in four batches ... One hundred civilians for each leader." The fourth leader would apparently set free the last 200. "Three hundred civilians have already been released," the report said, "but the unexpected happened when the remaining 200 disappeared.”  After getting their three top choices freed, perhaps they decided #4 was expendable, kept his prisoners, and … we don’t know what they did with them. The initial reports said it was around 200 people, maybe 260 or 300, in the house when it was blown up by everyone but the rebels. The house remains, but there still has been no revised explanation. Cuban news agency Prensa Latina heard in contrast that rebel "mercenaries" initially "kidnapped about 300 people," and when given an ultimatum by the SAA to release the prisoners and surrender, instead killed 233, including 88 children and women. It should be noted this would leave the clear majority of those killed - about 145 - men, which is partially consistent with the alleged rebel intent - to kill the men. We get so far several glimpses of the prisoners who remained in rebel hands, mostly in Al-Houla, being sewn-up or giving testimony. There is only one brief view known of "rescued" Alawites perhaps just arriving in Houla, not yet made to speak. This was posted by activist Jalal Suleiman of the Houla Media Office only on December 14, three days after their more useful videos went up, and just as Channel 4 was raising questions about the lack of rebel videos of the dead. This too failed to show any number of bodies, but rather, as translated, showed "Aqrab scenes shown for the first time during the rescue civilians." This shows two wounded victims: the toddler at right, a fighter showing off the torn-up sole of the child's right foot. An old woman in a dusty, torn-up black hijab is then seen. She's been badly injured in the head, left eye puffped up and bloody, left side of her shawl soaked in blood. Her face is a horrifying mask of human misery. She seems to protest something, but the armed men gently push her along the way to wherever she's being taken. One aspect of the Aqrab saga that’s strangely consistent across all sources is a group of 6-9 local elites, including three Sunni clerics, the town’s mayor, and two retired military officers (for more details correlating reports and names, see Talk: The Delegation). By reports, these tried to negotiate some solution to the impasse. At least some and perhaps all of them apparently died in the process. What they were urging exactly isn’t clear. Only a promise of no harm is mentioned on the rebel end, and no one mentions the delegates making any demands on the rebels. Presna Latina heard that among the dead were "representatives of Akrab town that acted as mediators in favour of those held in prison before the mercenaries. Otherwise, all seem to be local Sunnis who apparently met the rebels’ approval as mediators and were allowed in, perhaps sent to talk sense into the "Shabiha" to surrender and let their "prisoners" go. In the "chains of love" possibility (see talk page for now), they’d be urging the men to surrender to execution, and the women and children to unknown conditions in rebel captivity. Hassan for The National noted as one of the good signs we can find in Umm Ayham's story that the Sunni villagers hadn't attacked the Alawites earlier in the conflict, and even when they did, "the mediators," who tried to help free the people, "were also from the village,” and in fact were even Sunnis. Whether they were really trying to help the desperate Alawites or to help grease along their destruction isn’t entirely clear. The one visual confirmation we have of a death in the delegation is a video purporting to prove the “martyrdom of Sheikh Ali Omar” (as Google translated), via Houla activist hassan husein (his only video uploaded December 11 – the 10/11 date is apparently a typo). The man shown (at left here) is middle-aged, in secular dress. He’s got blood coming from his nose and right ear, and a badly puffed-up black eye on the left. He was apparently beaten up, perhaps had his nose broken, and might have been shot somewhere in the head, or just beaten more. Alex Thomson spoke with officials in Hama negotiating for the prisoners’ release. He reported back these officials “believe," but don't have confirmation, that "the imam, and the mayor, and many others, have been killed." The refugees in Taonah didn’t mention them being killed, but do specify it was they who decided to take the negotiators prisoner. As Thomson reported “When they arrived, the prisoners would not let them leave. As Ali (Al-Hosin) puts it: “Once they came into the house, we just said, ‘We all go together, men women and children – or we all die together.’” On video, Ali is translated saying "either we all go out together, including the sheikh and the mayor, or we all die together." But that's not quite the way it turned out. As stated, they were killed by the Shabiha captors, before the same killed all their wards and committed suicide/vanished. The prisoners who admit taking them also killed them and didn’t mention that part. The first option is just what rebels allege and is seriously unlikely, given the other evidence now available. The second option is the most emotionally appealing. The third is perhaps the best explanation. Considering the mass of starving Alawite prisoners already fiercely resisting the rebel final solution for them, and a few well-fed Sunnis wading in urging them to give in, it’s quite possible the latter could get themselves shot or beaten down, depending what was handy (the prisoners could, theoretically, have smuggled in a few guns, which would help explain the stand-off situation). Lower right, the location a mutilated man named Ahmed Daoud was filmed, ostensibly on Dec. 10, slumped in a chair on the approach from al-Houla (see here). To the southwest (off-frame): Al-Taonah, refuge for freed captives. To the west (off frame): Baarin, like al-Houla, a rebel town with sectarian tensions against Aqrab's Alawi, possible source of some attackers. Western Alawite district: boundaries unknown: housed about 2-3,000 of a town of 10-13,000. Easily hit from Baarin. 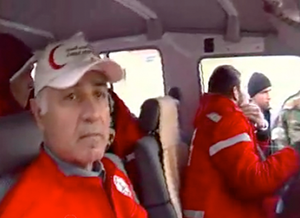 "Red Crescent" parked is not certain, but the best identifiable match for the intersection the Syrian Arab Red Crescent team was seen on a video dated Dec. 10. See also below, section below.) They would likely have come from Hama and already passed the main checkpoint. Possible route to see the hostages suggested with a "?" 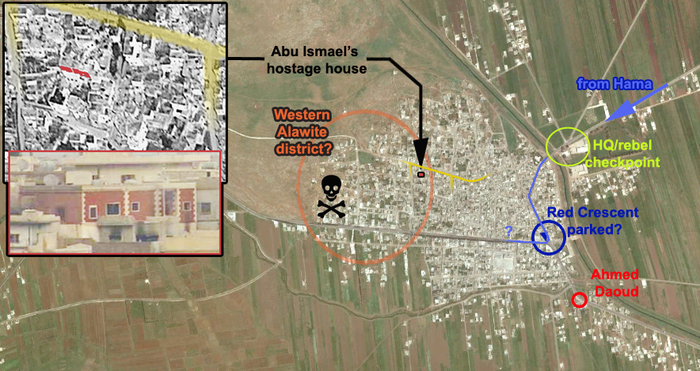 Abu Ismael's hostage house: unclear if it's part of the Alawite area, but likely so. Yellow road section is just to to help clarify its location (and to suggest a more direct route for the Red Crescent). Location pinned down by Channel 4 video (filmed from the edge of Taonah), derivative panorama, and Filed of View study below. Some if not many have feared that the revolution would unleash massacres, ethnic cleaning and even genocide upon the Alawite population of Syria. ... This horrific crime, however, was not committed by revolutionaries, extremist or otherwise. This is the story of some of those women and children who survived the massacre perpetrated against hundreds of them by the savage and psychotic Shabbiha of al-Assad, as told by the survivors themselves and by activists documenting their testimonies. All of them are Alawites. According to the testimonies, the purpose of this massacre was to frame the FSA. Juan Cole who is in Damascus, however, mentions that he has been going to all the regime’s propaganda channels and found that there was “not a single peep about it.” Perhaps it was only for the Alawites to know about, to fear for their fate if al-Assad falls, whether at the hands of the FSA or the regime. 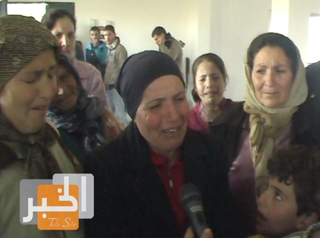 Like these poor people from Aqrab, the Alawite community of Syria has been taken hostage. There was a vague suggestion that the Alawites of Aqrab had been trying to work hand-in-hand with the FSA to break the government's grip. A video of December 4 purports to show FSA and the Alawites at Aqrab village. Cluster bombs are shown, as rebel fighters speak of their time in the village. It's all in Arabic, so we can't tell if these are supposed to be Alawite FSA, FSA working with Alawites, FSA threatening to kill Alawites, or what. A few early Twitter messages sought to spread this idea from the outset. Tazi Morocco tweeted "#Aqrab Massacre: 10 pro regime gunmen held 150 alawite hostages, and killed them when #FSA tried to save them #Syria." NM Syria tweet: "The Alawites in Aqrab oppose the regime and its crimes. Regime forces bombed and shelled Aqrab this morning. #Syria" - First posted 2012-12-11 19:21:46 by NMSyria. Response: "Today is a clear warning to Alawites, the regime will also hurt them to get what it wants. 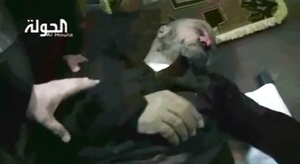 Awful things happening in Aqrab #Syria" - First posted 2012-12-11 19:31:36 by Rose Alhoms. As late as the 13th, Enduring America was following a theory of a massacre-free scenario that still involved some degree of Alawite uprising to explain the alleged, and exaggerated, intra-sect violence. In this attempt to make sense of it all, "the town was bombed, and the largely-Alawite population has split into pro- and anti-regime groups. There has been fighting,"a few deaths, and no massacre. Then Channel 4's reports hit, and the calls went quiet; it didn't seem to be such an exciting "turning point" any longer. At least two Arabic-language video reports from the safe haven of Al-Taonah are known: Al-Khabar TeleSite (Syria) and Al-Mayadeen (Lebanon)  The details they heard and share are in line with Channel 4's report, and worked into the content above. Clearly, these reports have figured little into Western and opposition reports by which the world prefers to move. The following traces out the contours of how that world reacted to the ambiguity inserted by Channel 4's report as a lone anomaly with absolutely no further details available. Opposition videos circulated widely on the Internet suggest that pro-government militiamen known as shabiha were responsible for the killings in Aqrab. An unanswered question was why regime gunmen would kill Alawites presumably allied with the government. Britain’s Channel 4 News managed this week to reach the outskirts of Aqrab. Its version of events implicates the rebels. The details are then related in moderate detail. Supporting this somewhat is the lack of such a statement, despite a low-quality 30-second video posted December 10, showing a team from the Red Crescent, purportedly in Aqrab. No mention is made of the purpose of their visit, but they're sitting in their parked ambulance, awaiting some clearance to move forward, something like nine days in (more like eight, at the most) to the quiet crisis. If they're speaking with the captors to arrange a visit, it must be remembered this is an opposition activist standing here filming them, and it seems to be their fighters standing at the windows. It's not certain which part of town this is filmed in, but a good guess is ventured on the map above, looking like a second rebel checkpoint on their likely path. The team looks somber (see inset). It's not clear if this is before or after seeing conditions at the Abu Ismail house or if they ever got there; a transcription of what's audible would provide clues. LA Times passed on Nadim Houry, deputy director of the Middle East division of Human Rights Watch was quoted as saying the situation was "very murky," but somehow he was sure "a number of people" had been killed. "There are various narratives there, and we don’t have enough to have a conclusion yet," Houry said. "I’m not using the word massacre. It’s not clear to me how they died." As of February 11, two months after the alleged massacre, Human Rights Watch still has not issued any official statement whatsoever. Mr. Houry had assured the public early on that there was an investigation quietly proceeding: "still investigating. … ongoing investigation … Where did I say we concluded our investigation.”  This delay was the subject of a critical open letter to HRW, sent by wiki member Adam Larson (Caustic Logic) on Dec. 22. At the moment, it seems likely their investigation will never have a conclusion. There are plenty of videos around of alleged survivors and witnesses to the events. These are covered below. Here, we look for cases where the camera itself was a witness and lets the rest of us be. Videos of the negotiations, Shabiha captors, the fire fight, grenades lobbed at prisoners, blowing up the building, army shelling it, or warplanes bombing it, or any violence or anything happening around the building, apparently do not exist in the public sphere. Video proof of the events is apparently not the strong point of the rebel argument here. If any surface, they will be quickly noted here. According to the emerging narrative related by survivors and escapees, the final sequence of events rebels give as leading up to the bombing actually began on the afternoon of the 10th, running up to midnight, apparently culminating in the first hours of Dec. 11. Anyone looking through videos might keep that timeframe in mind and look for night or early morning shots. As Thomson heard, the taking of hostages didn't occur on the day of the alleged massacre, but rather nine days earlier. Since the reported rebel take-over of the city is of such duration, anything from December 2 forward might be of value in understanding what happened during the curious blank spot in the record that is Dec. 10/11 prior to the interviews with survivors. A good list of some of these is compiled on the discussion page. This page was last edited on 12 April 2017, at 00:25.